Miller Sports Properties and the NBA Development League today announced that the Utah Jazz have acquired the Idaho Stampede, becoming the eighth NBA team to fully own and operate their own NBA D-League team. The Stampede have also signed a one-year contract extension with the downtown arena and will continue to play in Boise, Idaho for the 2015-16 NBA D-League season. Per team policy, financial terms were not released. Miller Sports Properties is a leader in the sports and entertainment industry as operators of the Jazz, MiLB Triple-A Salt Lake Bees; Miller Performance, consisting of Miller Motorsports Park, the Ford Racing School and Oneiro; EnergySolutions Arena; KJZZ 14 Television; The Zone Sports Network (97.5 FM, 1280 AM); Larry H. Miller Tour of Utah professional cycling race; and All-Star Catering. Last summer, the Jazz and Stampede entered into a single affiliation for the 2014-15 season where the Jazz managed all aspects of the Stampede’s basketball operations while the local ownership group, headed by Bill Ilett, maintained the primary responsibility for the team’s off-the-court business operations and community initiatives. Steve Brandes will continue as the president of the Idaho Stampede. He has been with the Stampede’s front office for 13 years, including eight seasons in his current role. Through his time, Brandes has helped the team’s transition to the NBA D-League from the Continental Basketball Association and its move to the 5,000-seat CenturyLink Arena. The Stampede won the 2008 NBA D-League championship. The Jazz are the eighth NBA team to own their franchise, joining the Cleveland Cavaliers (Canton Charge), Golden State Warriors (Santa Cruz Warriors), Los Angeles Lakers (L.A. D-Fenders), New York Knicks (Westchester Knicks), Oklahoma City Thunder (Oklahoma City Blue), Philadelphia 76ers (Delaware 87ers) and San Antonio Spurs (Austin Spurs). The Jazz have called up 20 different players from nine NBA D-League teams since the 2001-02 season. Players on the current Jazz roster with D-League experience include Ian Clark, Jack Cooley, Bryce Cotton, Jeremy Evans, Rudy Gobert, Grant Jerrett and Elijah Millsap. Since player assignments began in 2005, the Jazz have had five different NBA D-League shared affiliates and have placed 10 different players on a total of 24 assignments, including three players this season on four assignments to Idaho. Located less than 350 miles from Salt Lake City, the city of Boise has long had a strong Jazz fan base and has many ties to the Jazz organization. 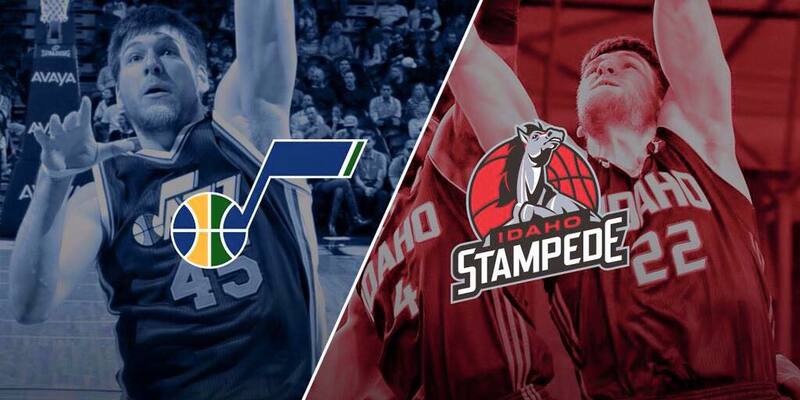 Utah previously shared affiliation with the Stampede during the 2006-07 and 2011-12 seasons. In addition, Utah held training camps on the campus of Boise State University from 2005-08, and has played eight preseason games in the state of Idaho over the years, including six in Boise. The first Stampede player ever called up by the Jazz, Sundiata Gaines, hit one of the most memorable shots in Jazz franchise history – a dramatic buzzer-beating, game-winning three-pointer on the ninth day of his initial 10-day contract to beat LeBron James and the Cleveland Cavaliers, 97-96, on January 14, 2010. The 18-team NBA Development League, founded in 2001, is the NBA’s official minor league whose teams have direct affiliations to NBA franchises. This season, more than 40 NBA D-League players have earned more than 50 GATORADE Call-Ups to the NBA, while 55 NBA players have spent time in the NBA D-League on assignment. More than 40 percent of the last five NBA Draft classes have honed their skills in the D-League, including 15 2014 first-round selections.